The Well-Armed Lamb:The Bleat Goes On! : El Differente's Cumples! Today is Tommy Maccione Day in Santa Fe. The New Mexican had a nice story. It would have been his 105th birthday. 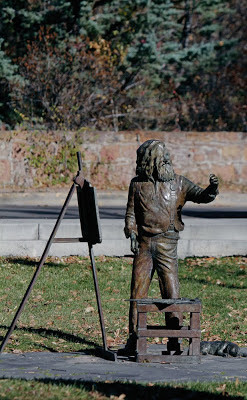 He was an authentic Santa Fe character, a small, skinny fellow often dramatically attired in flowing hats and scarves and billowing coats; he wore wildly long, flowing hair, and a long beard--as well as what seemed to have been a perpetually runny nose--standing at his easel, en plein air, at various, splendid vistas and locations around the city. In "The City Different," Tommy was "El Differente." He ran for every office imaginable, and frequently addressed the City Council, especially if people were hassling him about his dogs. He ALWAYS had at least one dog asleep at his feet, and at LEAST a dozen more at home. One place he favored was the corner of Camino Santander and Camino Monte Sol, for its unobstructed view straight up into the Sangres, over a fairly deep arroyo. That was where my grandparents' house stood/stands, and I would see him often when we spent summers there in the '50s. "Jeez, RIchard! Tell Us How You REALLY Feel..."